This classic Colonial on almost a half acre at 35 Old Road, rebuilt in 1999 and recently renovated, is close to Post Road East and its stores, gas stations and grocery market. It is also close to the I-95 entrance in Southport and the Southport and Greens Farms train stations. 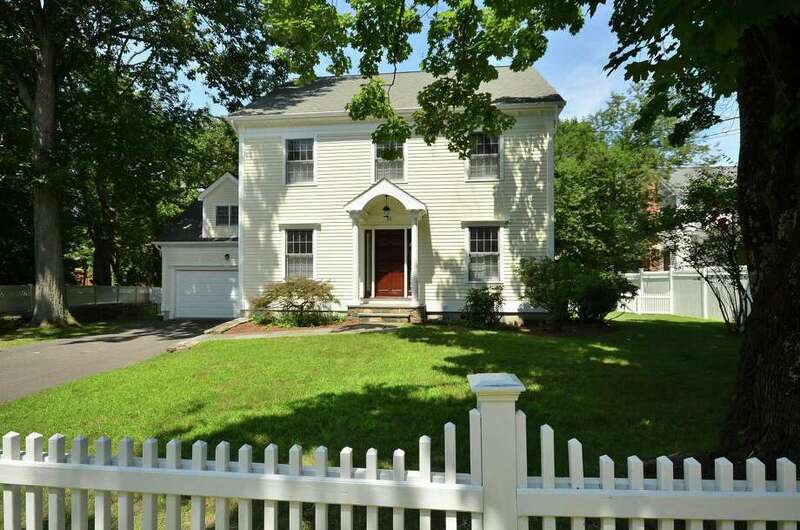 A classic Colonial at 35 Old Road off Post Road East in Westport, not far from the Fairfield town line, dates back to the mid-20th century, although little of its original form exists. The house was originally built on the property in the Hunt Club section in 1941. It was rebuilt in 1999 and it was recently renovated from top to bottom, giving the house the look and feel of a newly constructed home that better fits into the needs of a family in the 21st century. The renovation included installation of new floors, baths, lighting, fixtures and other features. A portion of the property is bordered by a stone wall topped with a white picket fence. The property is surrounded by trees, which provide a veil of privacy. Its proximity to Post Road East, and the many retail stores, gas stations and a grocery market along it, make this a very convenient location. It is also ideal for commuters because it is not far from an entrance to Interstate 95 in Southport and the Southport and Greens Farms train stations are also nearby. Some amenities are within walking distance. The Fairfield County Hunt Club, which offers horse-riding lessons, equestrian competitions and other events, is only blocks away. The house is also walking distance to the Sasco River-Kirik Open Space in neighboring Fairfield. The 3,844-square-foot house has a clapboard exterior and the front entrance is flanked by sidelights. Inside, the formal living room has the only fireplace of the house. The formal dining room has raised millwork on the ceiling and chair railing that serves as the line of demarcation between two different wall colors. The color on the lower portion of the wall, below the chair rail is a medium gray, and above the rail the walls are painted in a butter cream yellow. In the kitchen, features include an eat-in area, granite counters and sliding doors that lead to the large wood deck in the backyard. Although the property is just under a half acre, it is large enough to have room for a swimming pool. Upstairs, there are five bedrooms. The master bedroom suite has a walk-in closet and its master bath has a tile floor, a hydro-jetted tub, walk-in shower stall and white subway tile backsplash. The lower-level play room has a composite floor. This full, finished walkout basement has a full bath with a stall shower, which would be ideal for a gardener. For more information or to set up an appointment to see the house, call Helen Cusa of Halstead Property at 203-451-7731 or email her at hcusa@halstead.com.